Electronics products are pervasive but we tend to take their presence for granted. Those which do attract public interest are consumer electronics whose production is often dominated by companies in the Far East. 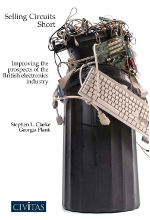 This perhaps explains why Britain’s electronics industry has been undervalued, with the Government failing to recognise its significance in the UK’s struggle for economic growth. Selling Circuits Short is a wake-up call for the government. Using data from leading market research firms, Selling Circuits Short shows that the British electronics sector is at a crossroads. The industry is in a good position to take advantage of growth in the markets where it is a dominant force but this will not happen unless the government addresses the challenges facing the sector.